This year has been super busy in the studio (Yay!) with orders for galleries, preparation for our show at Gray Street Workshop and commissions for customers. To add to the chaos, I spent January and February moving studios, which was such a hard decision to make, but one I am really happy with. After two wonderful years at Gray Street which was filled fantastic memories and the support of good friends, I was seduced by the allure of a large teaching space, air-conditioning and my very own lockable door. At the front of the Karma and Crow Studio Collective we have a lovely workshop area that is available to hire for classes and meetings. Featured to the right is one of Ellie Kammer's beautiful paintings which I mention below. Photograph courtesy of Bianca Hoffrichter. My new studio is light filled and spacious which is an absolute treat for me, given that my previous studios have been bursting at the seams with my hoard. Before I moved in, I wanted to ensure that I had heaps of storage space (to store the hoard, of course). I looked long and hard to find some excellent cupboards which I painted white with the help of my Mum who made a surprise visit from Perth. Thanks Mum! You never really realise how much it helps to have two people around until you try to paint and move furniture by yourself! My studio on the right with my awesome new cupboard (found on gumtree) which has pegboard storage cupboards as well as a retractable solid wood bench top. Photograph courtesy of Bianca Hoffrichter. My workbench where all the magic (and madness) happens. The new studio space is divided into two halves by a ply wood wall. Photograph courtesy of Bianca Hoffrichter. The studios back onto a superb new cafe which is a happy bonus for a caffeine addict. Run by two energetic creatives, Janie Kammer and Alana Crowe, the recently opened Café is already making waves in the local hospitality scene and is always packed full of punters, eager to get their daily caffeine fix. And most importantly, the cafe, where all the crucial things are made, i.e. coffee! I am now sharing with yet another talented and inspiring group of artists. Running the studios is Janie’s twin sister, painter, Ellie Kammer. Her beautifully graphic work is inspired by the suffering caused by living with endometriosis, a disease that effects the lives of many but is rarely spoken of. Jack Devereux is a talented up and coming artist who has an amazing ability to create depth with just a single drawn line. Bianca Hoffrichter is a photographer, artist and illustrator who is studying at the University of South Australia, has a passion for watercolour and is currently illustrating her first novel with intricate detail. Georgia Bailey is also studying Art at the University of South Australia has recently started up her own fashion jewellery brand working with leather, textiles and found shells to create her own wearable treasures. Lastly, Caitlin and Adam Thomas run their own tattoo studio. Caitlin’s beautiful tattoos are simple and playful, featuring the finest line work my untrained eye has ever seen while Adam’s complex illustrations are like a window into another world. I have never really thought about tattoos until now, but this blank canvas is certainly tempted by their talents! I am so privileged to be able to create in a lovely new spot surrounded by such a great group of people. If you are interested in coming down to see my new space and what I am making, please email me to set up a time. Exhibiting at Gray Street Workshop has definitely been a highlight of my year so far and after receiving some wonderful feedback and selling a few pieces, the show wrapped up last week. In celebration, we had an artist get together to see where the show might go next and it looks like we might take it on tour, adding new pieces to the collection, which is really exciting. Making works for exhibition is one of my favourite pastimes as there are fewer limitations on time and money compared to production work. This means I can go nuts on detail! It is also a much more creative way of working and I feel more freedom to address concepts that I care about such as the environment. For Solastalgia, I really wanted to use the opportunity to develop my work further. I have been making wearable Plastic Soup pieces for some time now to explore and engage people with the issue of excess plastics circulating our oceans. The response has been really positive, however, I have observed people struggling with the tiny scale of the work. Given their intimate location on the body, some people have been too shy to approach the pieces whilst others miss them altogether. In response to this, I wanted to experiment by removing the pieces from the body and increasing their size to see whether larger sculptural works would be more successful in engaging my audience. The increase in scale I wanted to achieve meant that silver was no longer a viable material as is too soft and tricky to work with at that size. I needed to find a metal which would stay rigid and was also able to be coloured black to give the pieces that seaweedy feel. I began experimenting with mild steel which can be blackened with white vinegar, a product which is good for the environment and can be reused as a cleaning product. It sounded like a win-win to me! Working with steel was an enjoyable challenge and a welcomed variation from my regular work with precious materials. Experimenting.... My first attempt at welding mild steel. To construct the sculptures, I began cutting various lengths of steel and finished each end to a blunt point which gave them a geometric feel. Many sticks to cut = very dirty hands. I then welded steel sticks together in pairs, intersecting them with other pairs to let the pieces take shape. I added more and more sticks until the shapes were completed then began working on steel boxes which were to contain the plastic fragments. 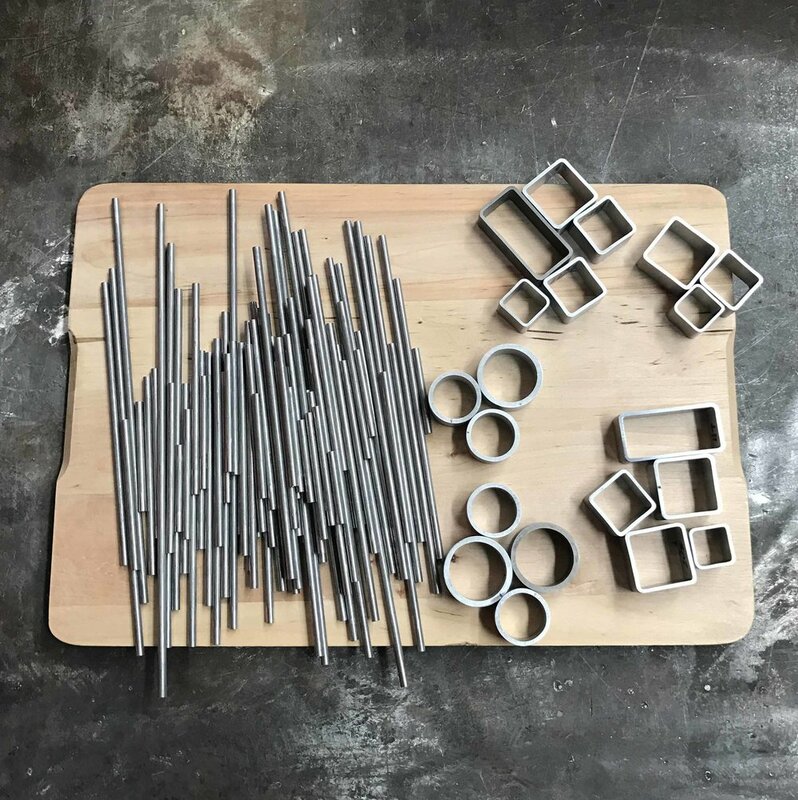 I decided to make them using a range of different shaped and sized steel tubes and discovered a real difference in the quality of welded steel tube compared to the usual silver products I have grown accustomed to. I cut each tube to size and spent days grinding down the messy seams to give them the finer finish I required. A whole bunch of steel tube slices fresh off the Brobo. They are really sharp and messy looking. So many hours work to clean these guys up, but the end product was definitely worth it. I then hand cut the acrylic ‘windows’ and gently filed them down to fit perfectly within the tubes. Each piece of acrylic is covered in tape to protect the surface and numbered so that I know which box they fit into. The acrylic has to fit the inside of the boxes perfectly so that they stay in place without glue. Many sleepless nights and an injured shoulder later, the tubes were welded in place and finally, construction was complete. When making jewellery and sculpture, finish is as important as construction. A beautifully constructed piece can be completely ruined if it is not finished well. I wanted to avoid this by giving my sculptures an even sandblasted finish which was then blackened and waxed. A beautifully sandblasted surface. After this stage I make sure that the sculptures are handled with cotton gloves to avoid contamination before I blacken them. Dipping the sculptures into boiling hot vinegar. Though I thought I measured enough before I began, unfortunately this one didn't quite fit and luckily I had some spare vinegar to top it up! With only a day to spare I prepared a variety of plastic fragments I had collected earlier, and set them in place. Phew! My favorite part of the process is choosing the plastic fragments to go inside each box. These plastic jewels were collected at West Beach and Aldinga Beach in South Australia. The final piece all blackened and set with plastic jewels. The response to the sculptural pieces was encouraging and my audience were much more inclined to approach the works to have a good look around at the colourful plastic treasure they contained. Even more interesting was their response to the related jewellery I wore after seeing the sculptures. They could see the relationship between the two and It really helped to open up a dialogue about the ‘Plastic Soup’ phenomenon which was my ultimate goal. I wore one of my brooches to the opening night of Solastalgia and it lead to some great conversations about climate change. My audience seemed to have much more of an appreciation for the tiny brooch once they had seen the sculptures. Since working for a jeweller I have seen many old and sometimes neglected wedding rings come through the door to be repaired. Years of everyday wear tend to reduce protruding details of the pieces such as claws and delicate filigree. Unfortunately for my lovely mum, her fifteen year old eternity band was in a bit of a state as hand making ceramics is not all that compatible with her desire to wear fine jewellery. Clay is a dusty material and the tiny little particles seemed to be wearing away at the surface of her glasses and her jewellery at a fast rate. Luckily I was up to the challenge of repairing the jewellery but maybe not the glasses. The piece came to me missing diamonds and slightly squished. On closer inspection with a jeweller’s loupe, my jewellery friend Kristy and I were astonished to see that even though it was bought as a new ring, it had already been reshanked (a new band had been attached) and was falling apart so badly that it wouldn't have lasted much longer. I had two options with this piece; I could try to salvage the remaining ring that, given the state of it, would probably still fall apart later or remake the whole thing to the same design. Considering that she works with her hands so much, Mum decided that she would have the ring remade using slightly thicker gold to make it more durable. I wasn't sure how good the quality of the original gold would be, so I decided to make the piece out of new gold, using the old ring as a reference. I rolled down a piece for the shank and hand pierced the pattern. As suspected, the original ring snapped apart with no pressure at all. Lucky she asked me to fix it when she did! I had to source some beautiful rose cut diamonds to replace the ones which were missing and remove the rest from the existing ring. I then prepared the setting and soldered it together. I set the diamonds and hand carved the band. Then finished polishing it and set the ruby. Its not a bad match!